Landingi review - Better than leadpages? Blog Landingi review - Better than leadpages? Landing page builders are now a must for people looking to bring life to their digital marketing efforts. The good thing is that you don’t need coding or IT skills to create landing pages. 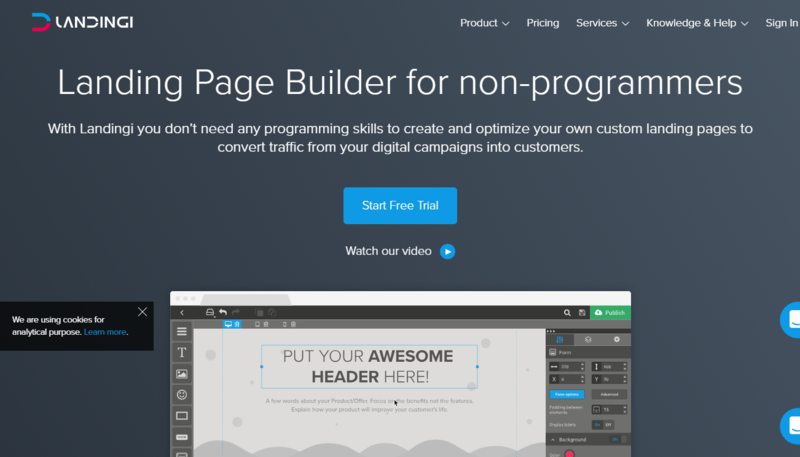 One of the best landing page builders on the market today is Landingi. It is designed to provide you with all the tools you need to make the landing pages more responsive to your customer’s needs. Read on to learn more about Landingi, landing page builder. Landingi is a landing page builder that guarantees to increase the conversion rates for just about anyone. It makes use of the pixel-precise drag-and-drop (PPDD) to provide you with end-to-end solutions for easily creating, customizing, and publishing all your landing pages. You don’t need coding or IT skills to be able to use Landingi. It is every digital marketer’s dream to come up with conversion-oriented campaigns. The over 100 templates are all high-converting and come with lots of in-built integrations to give you better results in your marketing efforts. Even better, Landingi enables you to personalize the landing pages to gear them for PPC ads and the target audience. What Are The Landingi Features? The features of Landingi are divided into several categories including the landing page builder, publishing tools, and lead management tools. Here is a sample of the best features of this platform. Drag-and-drop: To easily customize the landing pages, you can use the drag-and-drop editor to add or remove features from your design. You can, therefore, design landing pages without knowledge of coding. More than 100 templates: By choosing the best templates, you will find it easy to design your landing pages. You can then drag-and-drop the features you want. Media library On the Landingi platform, you will find numerous media elements to make part of your design. That includes images and icons you can add to your design. Fonts : There are more than 800 web-ready fonts from Google and you can access them through Landingi. If you have custom fonts, include them for enhanced design and branding. One-click duplication: On Landingi, it is possible to make copies of your landing pages. By changing the settings, you will be able to know which of the designs is working for your marketing campaigns. Are you a web developer or programmer? Landingi has an HTML editor to help you exercise your great IT skills. Amazon AWS Cloud Hosting: Because of its cloud-based nature, Landingi makes it possible for you to get free landing page hosting. With Amazon Web Services, you have 99.95 percent uptime. Domain mapping: To ensure brand continuity, it is possible to map a custom domain name to the Landingi URL. Let Landingi power and host your site even as it displays what’s on your custom URL. A/B testing: Split your pages and change features to know the buttons, titles, images with the best conversion rates. This kind of testing is very easy on the Landingi platform. The reason for Landingi’s success lies in the fact that it has a lot of great features. On the Landingi platform, it is very easy to add or remove anything. Customizing your landing pages is almost hassle-free. The Landingi, landing pages are 100 percent responsive. To design the landing pages, you don’t need coding or IT skills. All the features you need to work with come with the customizable templates. The landing pages you create using Landingi are easily accessible to your prospects. They may look plain, but the pages have the ability to concert potentials into paying customers in no time. It has a 24/7 uptime, is secure, and accessibility inscription since it is Amazon Web Services based. Administering and examining your leads on Landingi is one-stop and comes without much of a fuss. You need to define what responses you want from your visitors. After they have logged in and left, all the information about them will be sent to you in your Landingi invoice. You can then export all the leads to a sheet on Google through a single click. The number of landing page templates on Landingi is so massive you would be spoilt for choice. The more than one hundred landing pages are easy-to-customize using the great Landingi features. It is easy to integrate your marketing efforts by circulating the leads to CMS tools and mailing list. That way, you can easily get multi-faceted notifications on each and every one of your leads. Keeping track of planned new product launches and upcoming campaigns can now be done very effortlessly. Landingi also provides you with an auto-email responder which, together with webhooks give you feedback on a 24/7 basis. It is easy to know how many of your visitors were able to convert through Landingi landing pages. The platform is integrated with Google analytics to make it easy for you to follow up on the customer experience in totality. Do you want to know whether your conversion rates are efficient? It is possible with Landingi. Are you an interactive digital agency with lots of clients? Landingi is what you need to reach global audiences with your campaigns. You can hold several campaigns using one account by taking advantage of the special sub-accounts by Landingi. Monetizing landing pages is made easy through the custom templates on offer. Lead insights are presented in terms of secure anti-spam forms. You can, therefore, be sure of high-quality and secure leads. With Landingi, you will have to choose from any of the four packages. No matter your preferred package, you will get a number of benefits and unique features. The categorization of the packages is to ensure that all your landing page needs are met. You will pay only $29 to run smaller campaigns. It includes unlimited users count, landing pages, visitors, leads, and domains. You also get to enjoy the drag-and-drop creator, analytics, tracking pixels, lead inbox, communication integration, and email marketing. For only $49 Landingi gives everything in the Create Package and more. The additional features include integration with Sales and Zapier, Campaign Scheduler, integrations for marketing automation, Webhooks, Autoresponder, and A/B/x testing. If you run a digital marketing agency, it is highly likely that you work with many clients. You will pay $109 to enjoy similar features to those of the Automate Package and more. The additional features include custom templates, unlimited sub-accounts, unbranded emails, and custom image library. This is the costliest of the Landingi packages. For $185, you will get a set of unique features that dwarf the previous offers. It provides for custom branding, use of a custom URL, custom CNAME, error page, login page, and outgoing emails with branded addresses. The price is inclusive of a 25 percent discount, so long as you make the annual payment at once. Are you afraid of designing your own landing pages? Why don’t you ask Landingi to help you? Do you have a preferred external landing page? Why don’t you send it to Landingi for approval within 24 hours? After that, you can use the template or layout to design your landing pages. You will pay a $99 one-off fee and $29 for using the Landingi service. It is clear that Landingi is easily customizable given the drop-and-drag editor. The landing pages you produce through this platform can be used on any kind of device. Whenever you want to duplicate the pages, you can do it with just one click. Given the fact that you can copy, drag, and move any feature into the landing pages, Landingi is overall easy to work with the platform. It is possible for you to customize your data analytics by making slight changes to the code. With that, you will be able to have detailed insights concerning form and lead validation. As you can see, Landingi can provide you with very successful marketing campaigns at relatively cheaper prices. It is much better than the other DIY landing page builders, especially when it comes to its unique features. If you are a serious marketer, this is the platform for you. Using Landingi can guarantee to make your marketing campaigns more efficient than others. Due to the likelihood of helping in lead generation, this platform can guarantee growth in your business. For newbies and veteran marketers looking for quick lead conversion, Landingi is the go-to option.